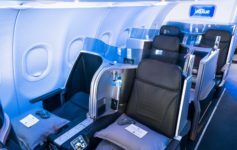 I’ve written about Air France/KLM Flying Blue Promo Awards in the past and though the program has become stingier in allocating Promo Award routes, each promotion cycle usually has at least a couple deals worthy of consideration. This fall, Flying Blue is offering 50% off economy class redemptions between Dallas and Europe and 50% off business class redemptions between Montreal and Europe. Flying Blue does impose fuel surcharges, but economy class fuel surcharges are moderate (about $225 r/t) and worthwhile, I would argue, for 25K r/t to anywhere in Europe. Business class fuel surcharges usulaly run between $650-750 per r/t ticket. At 62,500 r/t for business, that too is an acceptable price. Travel must be booked by July 31, 2014 for travel occuring between Septemebr 01, 2014 and October 31, 2014. Reservations can only be made online, so don’t bother calling if you do not see a route that meets your needs online.